Embargo until Wednesday, April 17, 6:00a.m. Almost one-fifth of families in Israel live in poverty, the highest rate among the OECD countries. Local social services departments deal with 266,000 assistance requests for people living in poverty, and the question of how to help poor families has preoccupied policymakers for many years. A new Taub Center study conducted by Prof. John Gal, Prof. Michal Krumer-Nevo, Shavit Madhala and Guy Yanay explores changes in the perception of poverty and methods for coping with it over time. The study shows that there has been a sharp decrease in the generosity and accessibility of Income Support over the years, which acts as a safety net for families living in poverty. At the same time, the government budget allocated for emergency assistance to these families remains limited. The growing economic distress of families living in poverty and the high volume of requests for assistance have led to a new approach to addressing poverty in social services departments in recent years. One manifestation of this is the development of the flagship program of the Ministry of Social Affairs and Social Services – the Breath of Relief program (“Noshmim Lirvacha”). The study examines patterns in the use of material assistance among various population groups participating in the program, and finds that individual characteristics, especially sector, are related to the extent to which the assistance provided by the program is utilized and the purposes for which it seems to be used. The researchers point to the need for flexibility and tailored assistance for families living in poverty. Most of the responsibility for financial assistance to families living in poverty was transferred from social services departments at the local level to the National Insurance Institute about four decades ago. Today, the assistance is granted mainly through Income Support distributed by the National Insurance Institute, while a smaller amount, earmarked for financing emergency assistance, is provided by the local social services departments. The Taub Center study notes that, in the past, Income Support was linked to the average wage. The economic crisis and rising unemployment in the early 2000s led to changes in poverty policy and was reflected, among other things, in a sharp reduction in the level of Income Support and in tougher eligibility requirements. As a result of these changes, the share of those receiving Income Support declined from 8% to 5% of Israeli families. The decrease in the level of Income Support and child allowances increased the gap between the level of assistance and the poverty line. At the same time, from 2000 to 2005, the incidence of poverty rose from 17.5% to a peak of 20.6% of Israeli families, and since dropped to 18.4%. Alongside the decline in the level of Income Support and eligibility, efforts were made to encourage the integration of impoverished populations into the labor market through the “Mirvacha La’avoda” program, which, despite being a leading program in the field (also known as the “Wisconsin Program”), was discontinued after a limited trial period. Even aid provided by social services departments, intended to provide assistance in situations such as difficulty to pay rent and the financing of basic necessities, underwent changes during this period. The main development was the expanded role of non-governmental actors – such as civil society organizations and private companies – in the areas of welfare and employment, which accelerated the outsourcing of social services. A prominent example of this is the International Fellowship of Christians and Jews (IFCJ) which doubled the sum transferred by the Ministry of Social Affairs and Social Services for material assistance administered by social services departments. However, due to bureaucratic difficulties and the approach of social workers in these departments, who believed their main purpose was to provide counseling and not material assistance, the budgets were not fully utilized. The social protests of 2011, and the recommendations of the Trajtenberg Committee that followed, led to a fundamental change in the discourse on social issues and poverty in Israel. In 2013, a public committee was established to combat poverty (The Elalouf Committee). The committee set an ambitious goal to almost halve the poverty rate within a decade, and recommended a number of steps to achieve such a goal. Of the recommendations, the government primarily implemented those designed to strengthen education, housing and employment. These measures epitomize the “social investment” approach to social welfare, which seeks to strengthen the human capital of families living in poverty – mainly by expanding early childhood care – thus enabling parents to integrate into the labor market and improve their children’s ability to escape poverty in the future. However, alongside these measures, there was no significant change in social welfare expenditure or expenditure for the impoverished population, and the percentage of those entitled to Income Support continued to decline from 5% to 3% of families in 2017. “Guardians of Israel”: The IFCJ transferred NIS 20 million a year to local social services departments, and invested in training social workers to distribute the funds. Due to the accessibility of the funds and the ease with which they can be used, the sum is generally utilized to its full extent. In recent years, the Foundation decided to gradually reduce the level of assistance until the funds are closed and transferred to the supervision of the Ministry of Social Affairs and Social Services. Flexible family budget: The Ministry of Social Affairs and Social Services has developed programs to improve family functioning and reduce poverty. These programs see the family as the preferred point of intervention and integrate elements of counseling, training and advising, budget management, and job-searching skills. In this framework, families are allocated a flexible budget, which can be used in various manners and is meant to improve the family’s employment situation (for example by funding childcare). However, the sum is not directly given to the family, but is rather allocated at the discretion of social workers. These two types of assistance have expanded both the professional welfare discourse and the understanding of poverty as a systemic phenomenon of socioeconomic inequality, which influences social workers’ approach to care. At the same time, the “poverty-aware social work” paradigm developed around 2010, which bases the discourse on poverty on families’ social rights. This approach paved the way for the implementation of the comprehensive Breath of Relief program and Rights Centers. Thanks to the additional Guardians of Israel funds and the Breath of Relief budget, the sum allocated for material assistance increased from NIS 60 million to NIS 100 million in 2016-2017. The Breath of Relief program has been in operation since 2015 and has become the flagship program of the Ministry of Social Affairs and Social Services. It operates in 108 low socioeconomic status localities and in deprived neighborhoods in large localities and, since its establishment, it has provided care for thousands of families. Gal, Krumer-Nevo, Madhala and Yanay analyzed data from the program, providing, for the first time, an understanding of the material needs of Israel’s impoverished population. The program consists of two main components: (1) Rights Centers – community centers focused on the take-up of people’s social rights and the implementation of employment and community programs; (2) An intensive 2-year family support program that includes a flexible family budget and social worker intervention. The cost of this program is NIS 100 million a year. Each family participating in the program receives NIS 8,000 a year (NIS 15,000 total over the two years of participation, reflecting a deduction of NIS 1,000 transferred to the locality for group activities). About 40% of recipient families have four or more children, and about 64% of the Jewish families (not including Haredim) are headed by single parents. The parents in most of the families have 12 years of schooling, 17% have studied in higher education, and 27% have less than a high school education. Most participants in the program are employed, but their incomes are low and allowances comprise the major source of their livelihood. Beyond the financial difficulties reflected in the families’ income data, most of them are in debt. About 70% of the families in the program reported being in debt, and it is reasonable to assume that the real percentage is even higher. It therefore seems that the flexible family budget is an important source for acquiring their basic material needs. The flexible budget seems to serve families for a variety of expenses: household needs (electrical appliances, furnishings, and household goods), employment (training and advising), paying off debt, and more. Plans for spending the money are made in cooperation with the family, and provide aid to ease both material and emotional deprivation. In general, the share of the flexible budget reportedly used for household needs stands out at about 42%. For Arab Israeli families, and even more strongly for Haredi families, the share of the budget reportedly spent on employment is significantly higher than in other population groups. 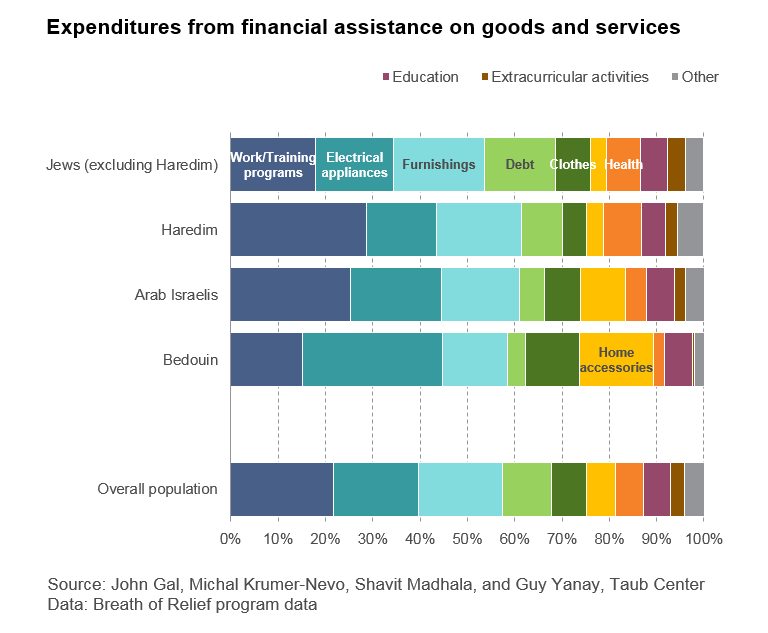 Among Arab Israeli families, especially Bedouin families, the reported spending on household needs, clothing, and footwear is notable; in other words, a larger portion of their flexible budget is devoted to basic needs, leaving them with less to cover needs such health and paying back debt. According to the researchers, these differences indicate the need to maintain the flexible nature of these budgets so that they can provide a real response to the different needs of the families participating in the program. Although flexible budgets are a central component of the Breath of Relief program, most participating families do not make use of the total sum of available aid. The sum used during the first year of the two-year program stands at only NIS 4,200, on average – a little over half of the total allocated sum. However, it seems that as the program has progressed there has been an increase in the share of the flexible budget utilized: participants who joined the program in 2017 used a larger sum. 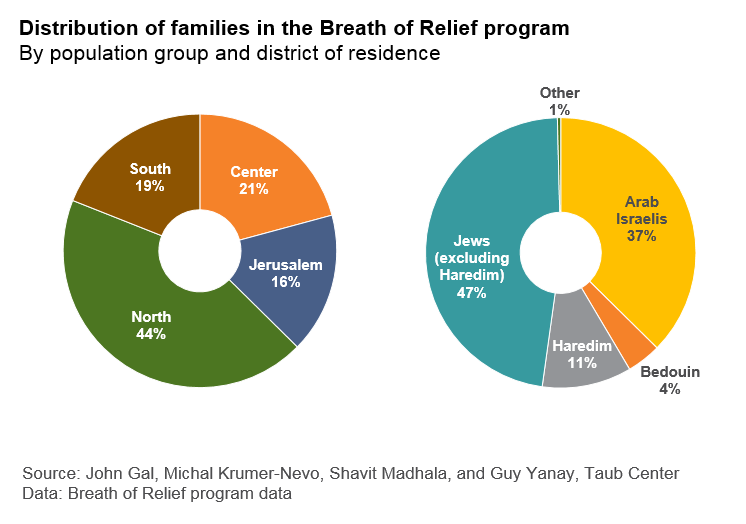 The Taub Center researchers note that only 42 families (less than 1% of participants) left the program within 6 months or sooner after utilizing part of the budget; that is, for most participants, the motivation to participate in the program is not only material aid. The researchers highlight the importance of using data on how assistance seems to be used, particularly among population groups that do not use the aid to its full extent, to examine how the welfare system addresses the needs of families living in poverty. They also note that, while government allowances are intended to meet regular living needs, additional emergency funds or funds for special needs are necessary as well. Furthermore, the researchers emphasize the importance of easy-to-use flexible budgets and the ability to tailor them to families’ specific needs.